These have not been available for a couple of years. I just noticed they are now back in stock. Just in case anyone has been looking for one. Last edited by JitteryJoe; Sun, Dec-16-2018 at 02:59:42 PM. 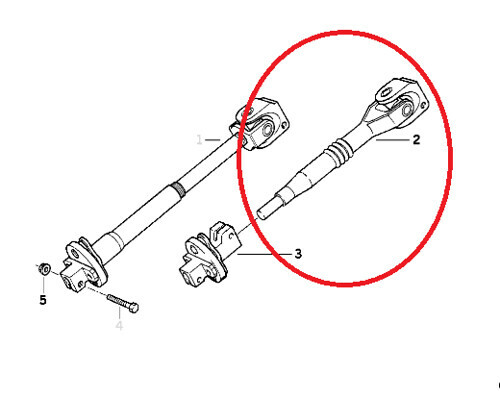 E34 M5 u-joint works better - part # 32 31 1 151 454. Joe, did yours have play in it? I don’t recall when I changed the shaft Guibo that mine had any play. Mine just looked well worn. I was going to change it as preventative maintenance since I had everything disassembled. This quite some time ago and when I went to order a new one I found they were no longer available. I just received a notice that they are now available which I found as a bit of a surprise so I posted in case anyone had a need. Some of the parts for these cars are getting harder to find (e.g. Power Steering pump). As soon as I got the email saying it was back in stock I ordered it. The plastic/rubber was gone around 2 of the u-joint caps at the top of the shaft. I only had a little bit of play, but knew it was a matter of time before all lubrication would be gone. I keep hoping as e36 prices trend up OE and BMW suppliers will start to bring back more of the important NLA pieces. Last edited by Reauxtide; Sun, Dec-16-2018 at 03:31:25 AM. All times are GMT. The time now is 10:56:50 PM.